Support from NSF grant DMS-0072312 and Penn State in the form of a sabbatical leave is acknowledged. The Hausdorff dimension of the set of numbers which can be written using digits 0, 1,t in base 3 is estimated. For everyt irrational a lower bound 0.767 … is found. 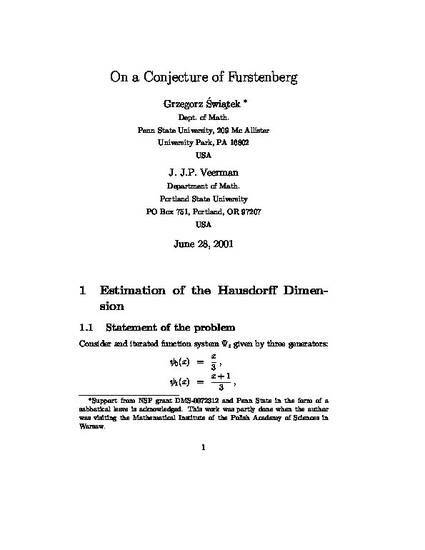 This is the author’s version of a work that was accepted for publication in Israel Journal of Mathematics. Changes resulting from the publishing process, such as peer review, editing, corrections, structural formatting, and other quality control mechanisms may not be reflected in this document. Changes may have been made to this work since it was submitted for publication.